Providing you the best range of combi ovens, inoxtrend combi oven, inoxtrend electric combi ovens, electric combi ovens, industrial regeneration ovens and commercial food steamer with effective & timely delivery. By keeping track with the market development, we are engaged in providing our clients with excellent quality Combi Ovens. Ventilation speed: Four ventilation speed selectables. Autoreverse: Autoreverse device for fast rotation direction reversal by the system XT Quick StopXT Optiflow® : Two special “rotating deflectors” delicately but effectively direct the airflow distribution inside the cooking chamber. Automatic Preheating: The electronic system will provide to automatically increase the selected pre-heating temperature. Cook Hold Steady holding temperature at 50°C for cooking with single or programmable cooking with multiple phases. Fast cooling: Quick cooling down of the cooking chamber, with open door, through the cooking chamber fan. About 150 stored programs (divided into 6 groups based on the type of food) with possibility for the user to add 150 more. Favourites: Cooking Programs Possibility to include favorite programs on a single list for easier management. Each profile can manage a different list of favorites. Automatic devices (XT Simcleaner) and products for cleaning chamber and boiler controlled by automatic programs. Working profiles : Possibility to manage three different profiles (plus default profile) with different languages and different lists of favorite programs. USB connection: Connection for USB pendrive for data transfer, software upgrade and backup. 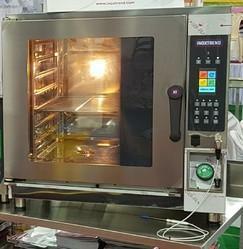 Professional Combi oven suitable to bake roast, grill, gratin, brown, glaze, boil, stew, steam; cook at low temperature; with temperature control at the core of the product, holding of already cooked food. Automatic cooking programs : About 150 stored programs (divided into 6 groups based on the type of food) with possibility for the user to add 150 more. 2 ventilation speed :Two ventilation speeds to be selected. Auto reverse : The autoreverse function reverses the sense of fan rotation each 4 minutes. Its opening permits the steam to go out from the cooking chamber. Fast cooling :Quick cooling down of the cooking chamber, with open door, through the cooking chamber fan. Automatic washing system with detergent tabs DETABINOX® and sparkling aid tabs BRILLINOX®. Our firm has effectively expanded its occupation in the market by offering elevated quality array of Inoxtrend Electric Combi Ovens. This oven is manufactured utilizing the best quality components in sync with the set principles of quality. 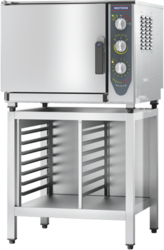 Used for cooking purposes in hotels and restaurants, the rendered rational combi oven is available with us in various technical specifications. Customers can buy this product from us at market leading rates. With enriched industrial experience and knowledge, we are providing an excellent quality Electric Combi Ovens. Designed with utmost precision, the offered oven is manufactured using premium quality components and sophisticated technology at vendors’ end. In addition to this, our oven undergoes different tests under the guidance of quality controllers, so as to ensure its flawlessness. Our provided oven is widely used in any type of kitchen for cooking purpose. By precisely understanding the needs and requirements of our customers, we are engaged in manufacturing and supplying a broad spectrum of Industrial Regeneration Ovens. 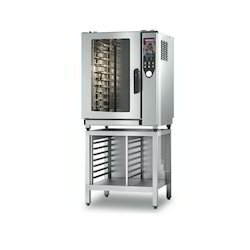 This electrically operated Regeneration Oven is specifically designed by the experts keeping in mind the varied requirements of restaurants, coffee shops, confectioneries and caterers. Keeping in mind customers variegated demands, we provide this bakery oven at affordable rates. 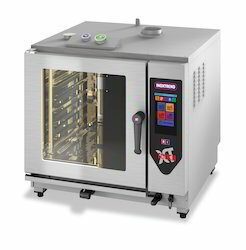 The XT Regeneration oven is designed to retherm (re-heat) bulk or plated meals for Cook-Chill, Cook Freeze or traditional feeding systems. The oven is constructed entirely from 304, 18/10 stainless steel. 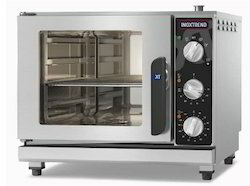 The REGEN XT Oven is electrically heated with a rethermalization capacity of 5, 10 or 15 GN1/1 pans. High-density insulation, auto stop on door opening, solid stainless door, and water proof chamber increase safety and durability. The unit has a 304 stainless steel interior and exterior doors. The doors are mounted on heavy-duty stainless steel hinges and incorporated in the door frame oven chamber there is an interior activated light. Fostered with a team of enthusiastic experts, we have been able to provide the best grade array of Commercial Food Steamer. This steamer is mostly cherished in commercial kitchens, bakeries, confectionaries and different food processing centres for steaming applications. The offered steamer is precisely manufactured under the stern guidance of ingenious professionals utilizing highly advanced techniques and supreme quality components. In addition, our valuable patrons can purchase this steamer at industry leading prices from us.